This week, I’d like to share a special interpretive signage project I recently completed. Last summer, my clients at the Upper Deschutes Watershed Council near Bend, Oregon, contacted me with a specific request: they wanted an interpretive sign on the topic of stewardship, and they wanted to use student-created artwork and poetry. I’ve discovered over the years in my business that using student work for an interpretive project—or any design project—requires a special touch. Sometimes, people are surprised to find out such projects often involve more time and can end up costing more in the long run. They are not merely design projects, they are learning experiences as well. But, if done right, it is most definitely worth it. In this case, it worked out great. The Watershed Council staff and their partners spent a lot of time working with the students, and they generated spectacular results. It was my job to take their finished work and tie it all together, designing a sign to feature the artwork—adding one illustration of my own for context—and to make the topic complete. The basic design was done to coordinate with an earlier series of signs I did for the Upper Deschutes Watershed Council. Click on the sign for a larger view. To give a background and context for the more imaginative student work, I painted a watercolor of the mountains and the headwaters of Whychus Creek. Peaks from left to right: Broken Top, South Sister, Middle Sister, North Sister. 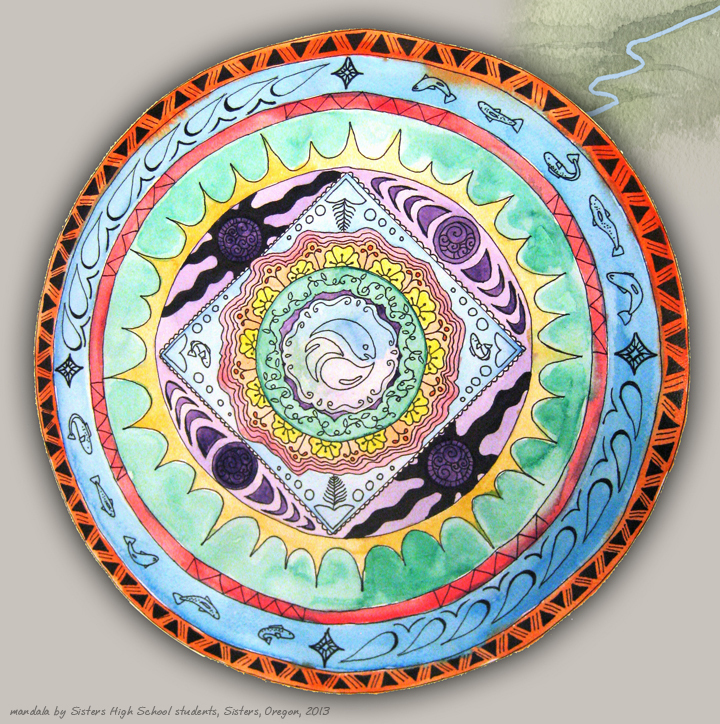 The other illustrations were done by high-school and middle school students.I particularly liked the center mandala. If you look at it closely, you will see it is amazingly intricate, with gorgeously designed elements pertaining to the river and the life it supports. And the salmon! Each one has its own wild design within the contour of the species—truly an artistic expression of the concept of Wild. Equally compelling were the poems. -Alaina Todd, Sisters High School. For me, this poem is deeply affecting. It really says it all—why we so desperately need to preserve the wild places left on earth. The Wild is our home. Our only home, in so many ways. If you’re ever in the vicinity of Bend, Oregon or Sisters, Oregon, be sure to visit the Whychus Creek Area and the Three Sisters Wilderness. 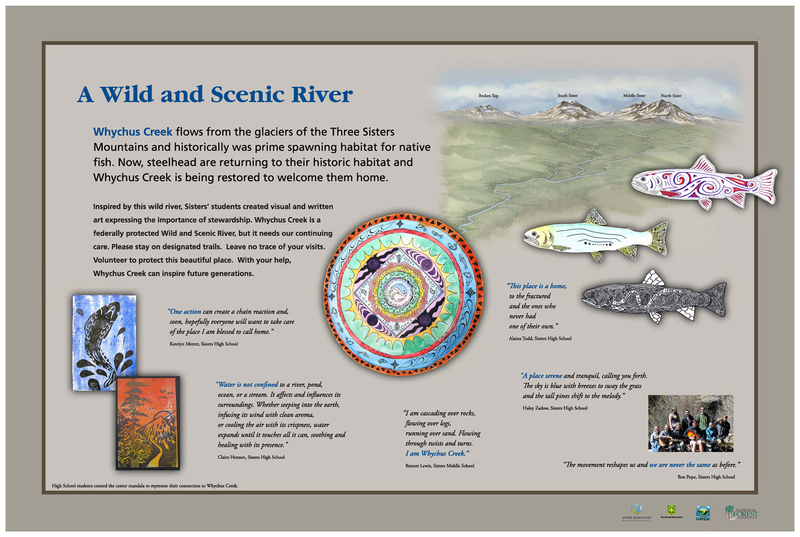 This entry was posted in Art and Writing, Environmental, Recent Posts, The Natural World and tagged Dahn Design interpretive signs, interpretive sign, Oregon Cascades, student artwork, student poetry, the Three Sisters, Three Sisters Wilderness, upper deschutes watershed council, whychus creek by dahndesign. Bookmark the permalink.